KABUL, Afghanistan (CNN) -- Afghanistan President Hamid Karzai issued a decree on Saturday that sets an earlier date for the country's presidential election, a move that could spark a constitutional crisis. 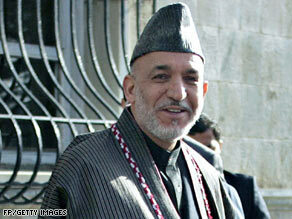 President Hamid Karzai believes an earlier vote would ensure someone is in place when his term expires in May. The decree counters a decision by Afghanistan's election commission to hold the election August 20. The written decree, based on Karzai's interpretation of Afghanistan's constitutional law, calls for balloting to be held at least a month before Karzai's term expires on May 22. The latest the elections could be held would be April 21. Karzai's move, which was expected, has prompted strong opinions. Some Parliament members say a vote after April 21 would be illegal, and some observers say Karzai has no power to issue such a decree. Many politicians in Afghanistan fear a dangerous power vacuum would develop between the end of Karzai's term in May and the August date set by election officials. No strong rival to Karzai has emerged on the political scene. The United States supports the decree, which will "ensure that the process be fair, transparent and open," according to a statement Saturday from the State Department. "Afghanistan requires an orderly, open and democratic process that ensures continuity of government through the election period to maintain political stability," the statement said. "The United States urges all parties to work together toward these goals ... In this process, the United States will neither support nor oppose any individual candidate."